Gold crown with decorative filigree and colored faux gem accents. One size fits most, up to a 22" head measurement. 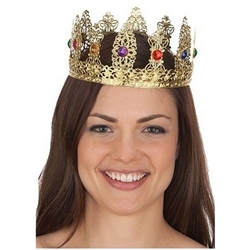 This crown is fit for royalty and can be used for a queen costume for Halloween or a royal themed masquerade parties. Directors and costumers can use it for queens on stage. It will also work for schools to use for Prom Queens.